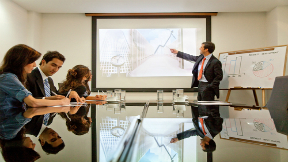 Microsoft PowerPoint has long been the go-to program for slide shows and presentations. But there are alternatives. And there are several good slideshow programs based in the cloud that can help you create powerful slideshows. PCMag.comrecently reviewed two of these alternatives, SlideRocket and Prezi.com. Both are good choices for businesses hoping to break free from the dominance of PowerPoint. SlideRocket comes in several forms. There’s a free version that allows you to publish your slideshow only as a URL. If you want to distribute and publish your slideshow in other ways, you’ll need to order a $24 monthly subscription. Once you pay for your program, you might be surprised at all it can do. AsPCMag.com reviewer Edward Mendelson writes, the program comes with fancy animations and transitions. You can also connect your slides to such items as current stock prices or real-time Twitter feeds. In fact, because SlideRocket is a cloud-based program, it is designed to extract everything from images to videos to Twitter feeds from the Web. Mendelson also reviews the cloud-based Prezi.com. Prezi, like SlideRocket, comes in free and pay versions. The free version allows you to create cloud-based presentations. The $59 yearly subscription version lets you create private presentations to be viewed by people you select. The $159 yearly subscription lets you create your presentation on your desktop instead of on the Prezi Web site. Where Prezi stands alone, though, is in how slideshows work. Prezi presents an animated tour that moves around a single canvas instead of a series of slides. This lets you create more imaginative presentations. It is, though, a bit more limiting. Prezi.com doesn’t come with as many design choices or resizing features. Of course, there’s a reason why PowerPoint has stood the test of time. It offers everything that you need to create a professional slideshow or presentation. It’s nice to know, though, that there are worthwhile alternatives. Explore Prezi.com and SlideRocket. You might be surprised at how powerful these cloud-based programs are.